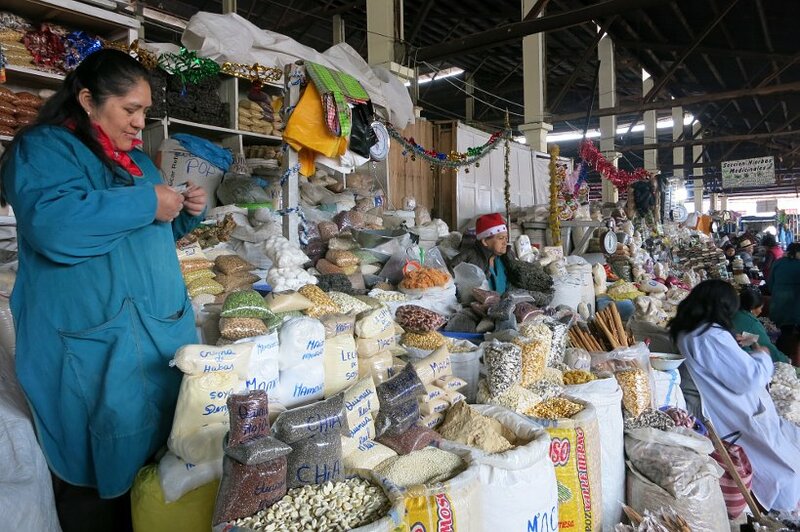 Visiting Cusco Markets and in particular Mercado San Pedro is a unique experience and a must do if you visit Cusco. The market is divided into several sections which all have their own specialties. You will find what you would expect from a farmers market: cheese, meat and fruit, flowers sections. 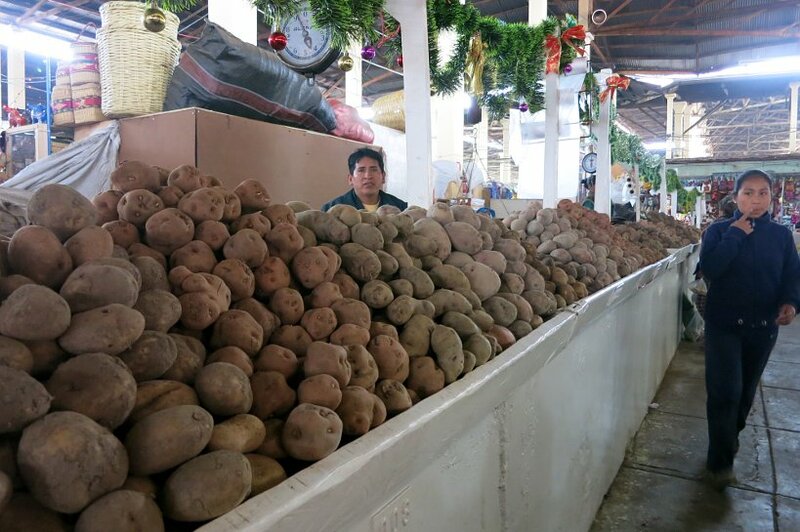 However in Cusco’s market you will you will find additional sections dedicated to the local specialities such as: a potatoes or papas andinas section, a grains section with people selling maiz or corn, quinoa, maca and kiwicha (Andean grains) and a gastronomy section. 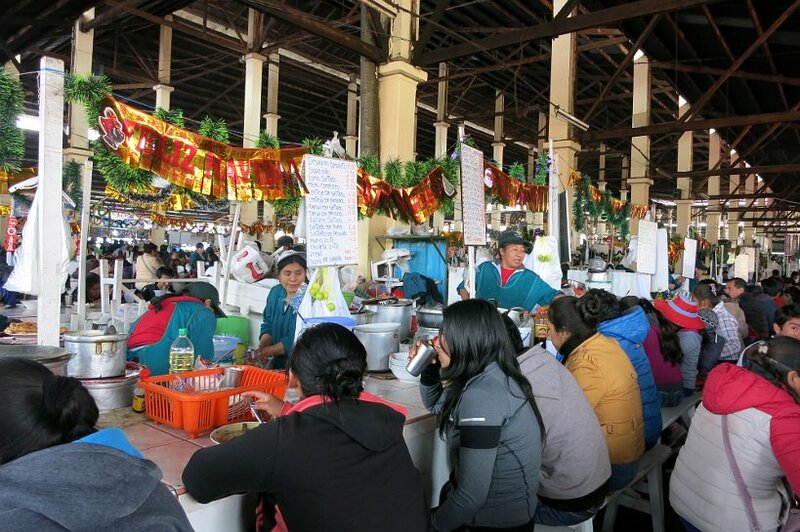 In the Gastronomy section, you have dedicated stalls to Peruvian gastronomy. 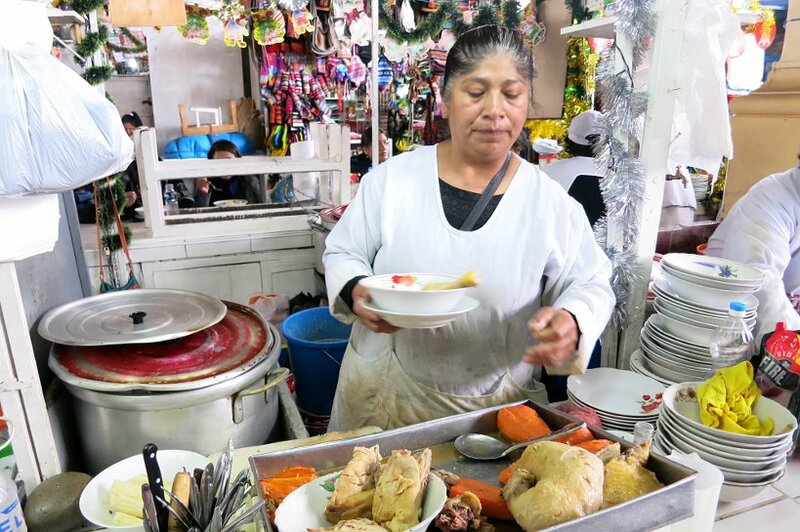 On one side of the market, you will find are stalls with very affordable lunch menus for about 5 Soles ($1.50 USD). The lunch menus include a starter usually a soup. 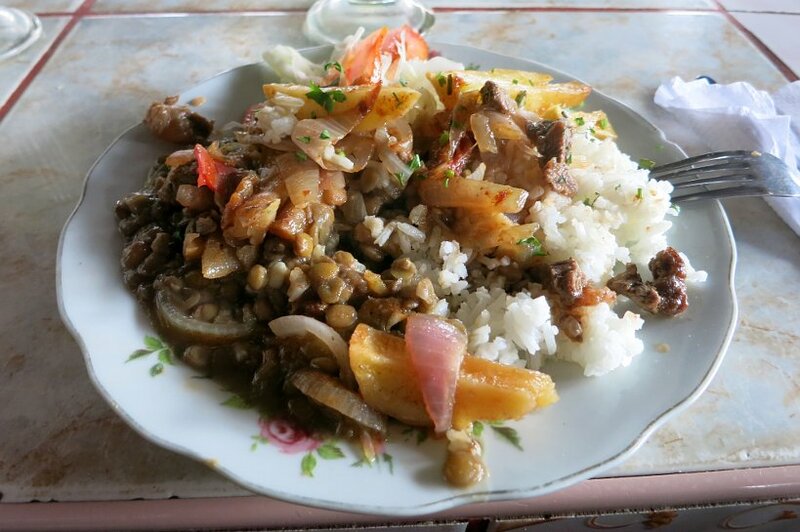 This is followed by a main meal and you get to choose from some of Cusco’s food specialties such as lomo saltado (beef stir fry with potatoes), estofado de pollo (chicken stew), and some vegetarian options like lentejas o arroz con huevos (lentils or rice with eggs). When we got to San Pedro market, we were amazed with the set up. Long lunch tables and benches and the idea is to find an empty spot and sit down. We could not resist trying one of the stalls. We found an empty space and sat ourselves at a stall which had a local speciality – Lomo Saltado. The starter was a vegetable soup or sopa de verdura. The soup came in a large bowl of broth with fresh vegetable such as potatoes, leek, corn and carrots. It was very earthy and very filling. After the soup, we tried the Lomo Saltado. This speciality is like a beef stir fry. It had rice and lentils with strips of beef sirloin. The beef was mixed with vegetables such as onions, tomatoes and fried potatoes. It was absolutely delicious and very flavorful. Another section in the market is dedicated to the local gastronomy. This section serves local Cusquena soups such as Caldo or Sopa de Gallina (hen soup) or Sopa de Pollo (chicken soup). 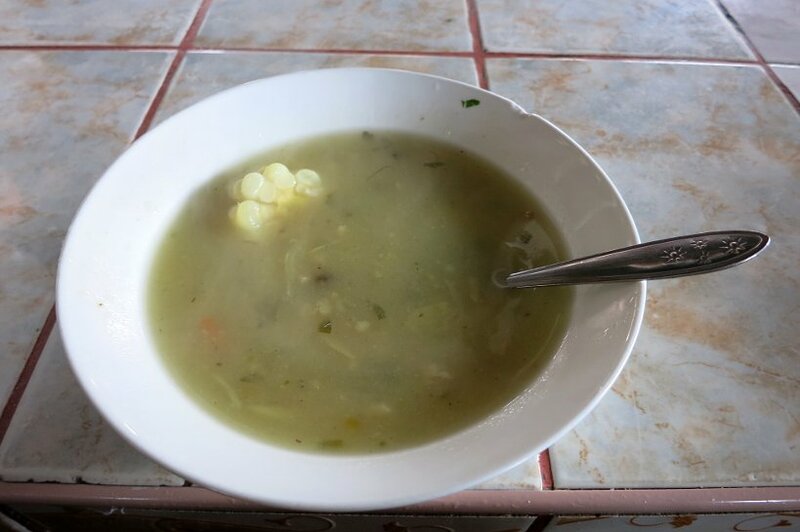 We went back to the market for lunch a few days later to try the local speciality Sopa de Gallina. It happened to be a rainy day when we got the market and we were happy to try the soups. We ordered the Sopa de Gallina and really enjoyed it. 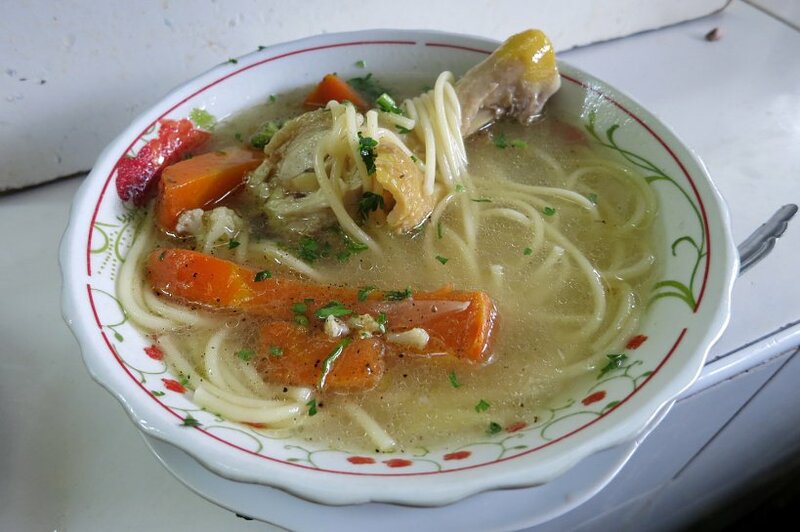 It was a simple soup made with onions, peppers, ginger, thin noodles and a big piece of chicken. Here we learned the difference between the Pollo (chicken) and the Gallina (hen). The Gallina is tougher than the chicken and has a slightly stronger taste. 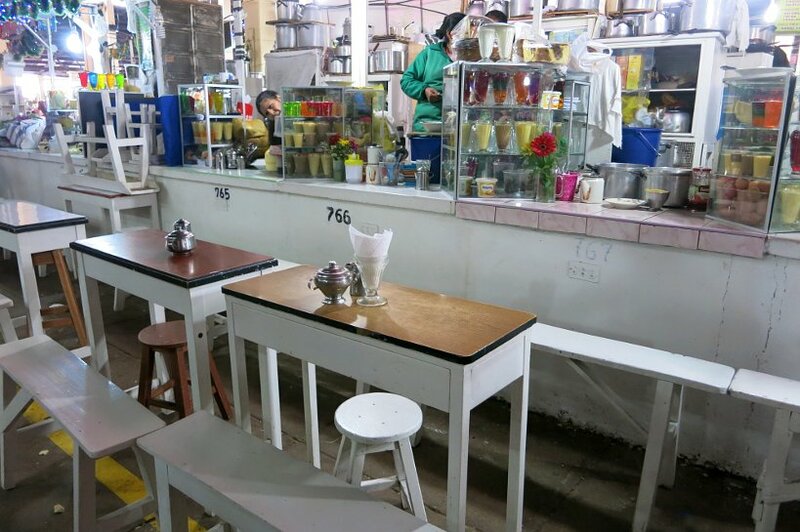 And when it comes to breakfast, juices, sandwiches and hot drinks (coffee, tea, mate) there is another dedicated section in the San Pedro market. It is a great place to grab something on the go as opposed to eating at a restaurant. We had sandwiches there a couple of times as well a few local drinks, like the Maca we describe below. 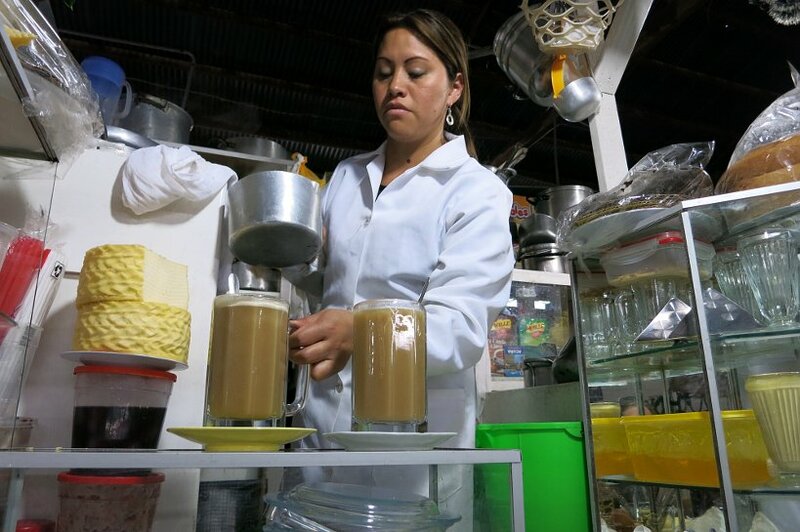 One of the local speciality drinks that we discovered was Maca. This is one drink that you should not miss out on. Maca is actually a root and it comes from the radish family. It has been cultivated in Peru for thousand of years. Maca is also known to have been widely used by the Incas. It was considered a sacred plant for providing fertility and energy. 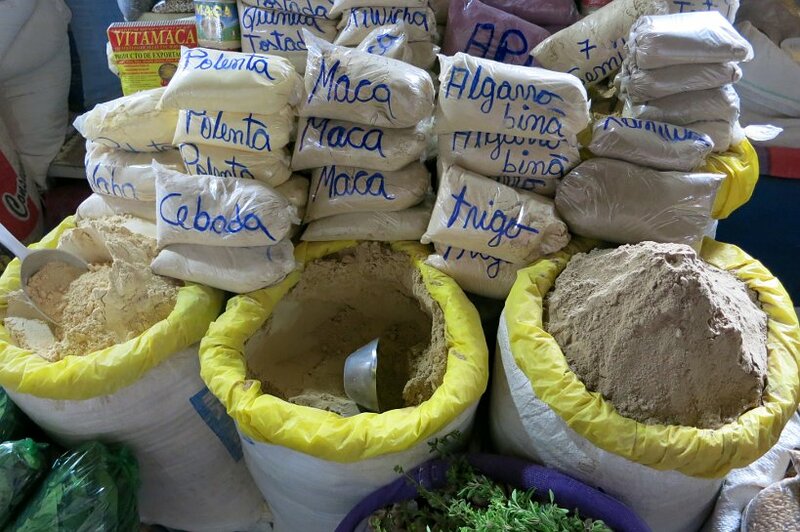 Maca is available at Cusco markets either in pill form or in a powder format. The root is grated to make a brownish colored powder. This powder is then consumed usually at breakfast with either milk, water, juice or mate. Maca has several health benefits and is notably known to boost the immune system, stimulate the libido and to balance the mood. We tried Maca at the market as a tea where it was mixed with hot water and cinnamon. The consistency does take some getting used to. It’s thick and slimy, very much like a hot cereal. One thing to mention is that it needs sugar added to make it tolerable. It is good for you, but it is an acquired taste. To explore the Incas culture, there is no better place than Cusco. It is the historical capital of the Inca empire. Cusco is surrounded by many Andean villages where Inca ruins remain. 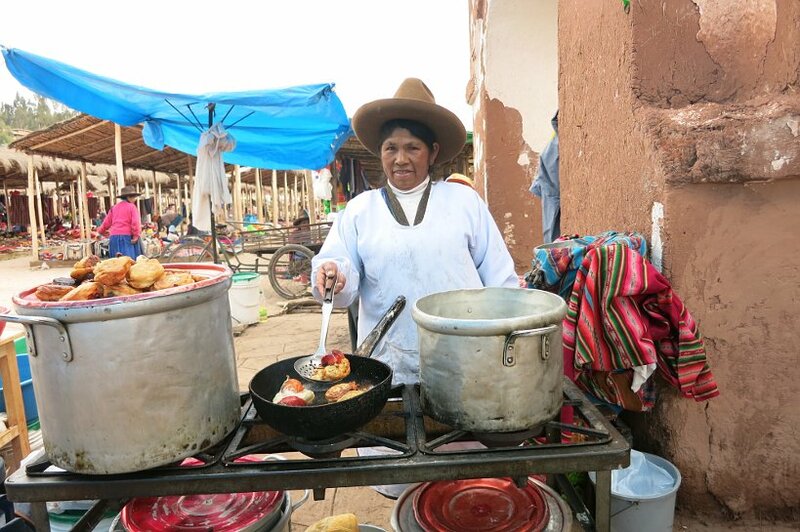 We visited Chinchero which is famous for its Andean market and well as the Incas ruins. 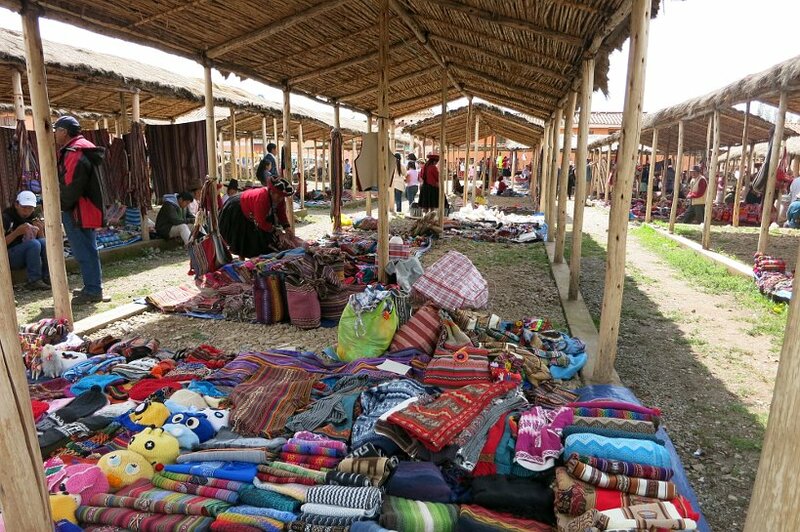 The Chinchero farmers market is one of the local Cusco markets where you will find traditional Andean crafts as well as local food speciality stands. Chinchero is located about 30 kms away from Cusco. We took the local bus or collectivo and it took about 45 minutes to get there. 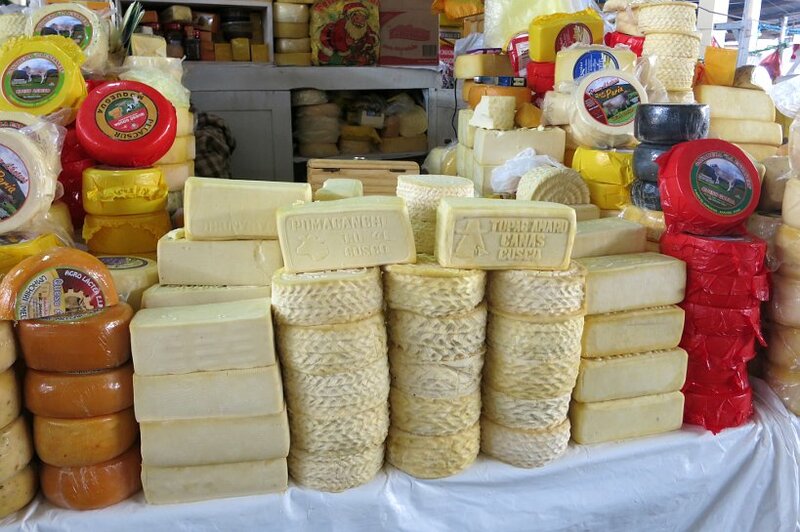 We were looking forward to seeing a market right outside of Cusco and experiencing the local food specialities. When we got there, we were surprised to see only a few food stalls. This was a major difference from the farmers market in San Pedro. 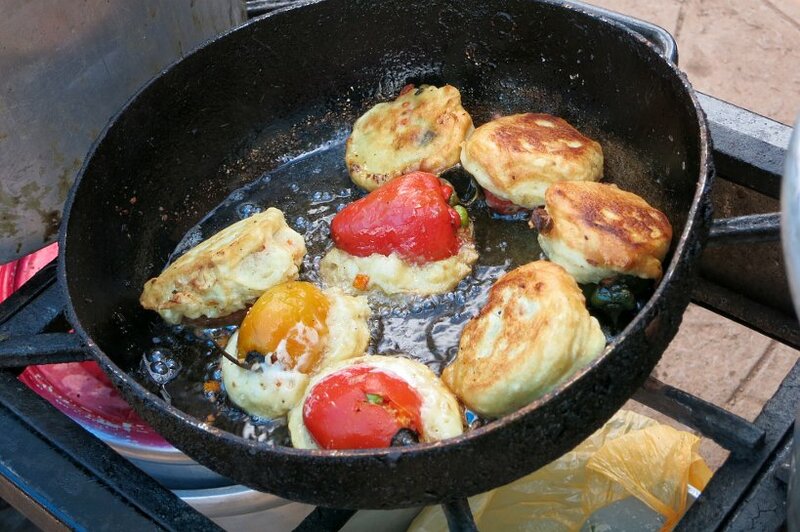 The local specialities that were available that day were the Chicharron (pork deep fried) and the Trucha con rocoto relleno (Trout with fried stuffed pepper). We decided to go with the trout local speciality. 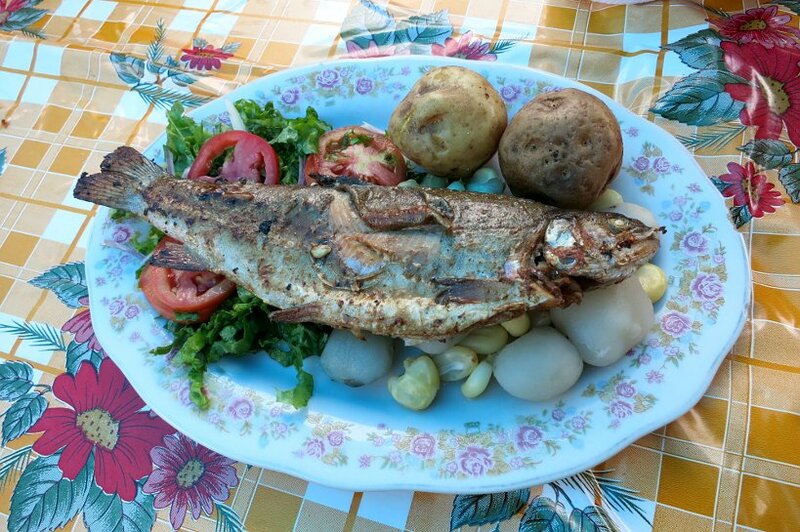 The trout was served with the rocoto relleno (fried stuffed peppers), two kinds of potatoes (regular and dehydrated potatoes) as well a side salad. After the meal, we went to visit the famous Incas ruins in Chinchero which were believed to the court residence of Inca leader Túpac Yupanqui. The most amazing thing about the place are the the huge cultivation terraces. 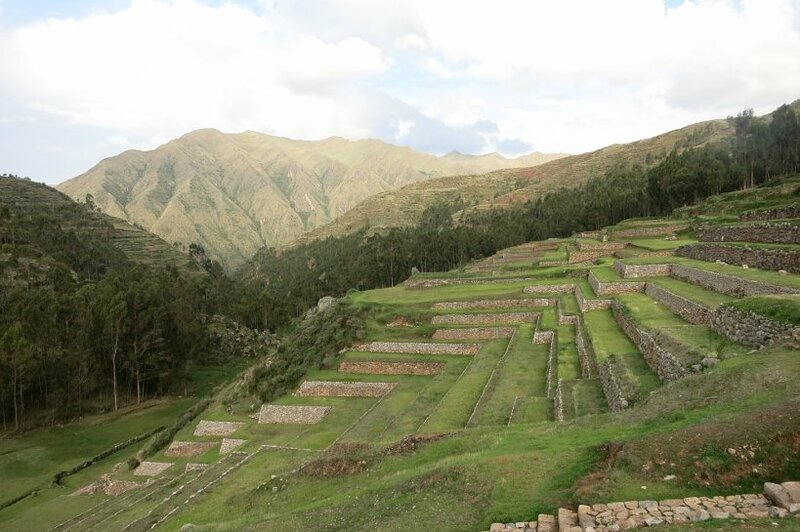 Here we tried to grasp the idea of the Incas cultivating different herbs and vegetables on their impressive agricultural terraces. Eating market food can sometimes lead to disagreeable outcomes. After the Chinchero market, I got a light stomach flu. Rosemary’ stomach was also upset, though not as badly as mine. 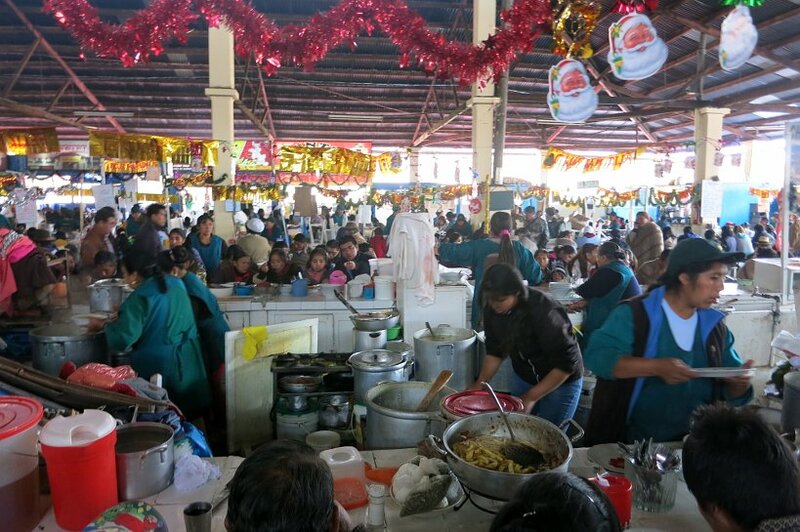 We believe we may have gotten sick from the poor hygiene at Chinchero foods stand. Needless to say that incident kept us away from experiencing local specialties for a couple of days. Our diet to get back on track was eating rice, banana, and crackers. We also used Activated Charcoal that we recommend highly, to help remove any poisonous effects of the food. 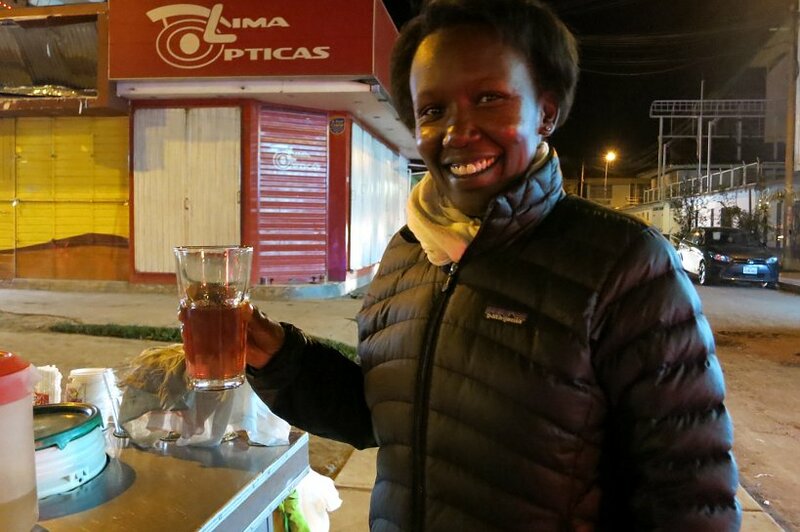 When we shared our experience with our Airbnb host, they told us about natural healing drinks sold on the street corners by vendors. These are little medicine carts on wheels that you can find in the evening at practically every street corner in Cusco. These carts are very unique. They have two big covered bowls on the flat surface and several intriguing pharmaceutical like bottles on the side of the cart. With nothing to lose, we decided to give the local medicine on wheels a try. 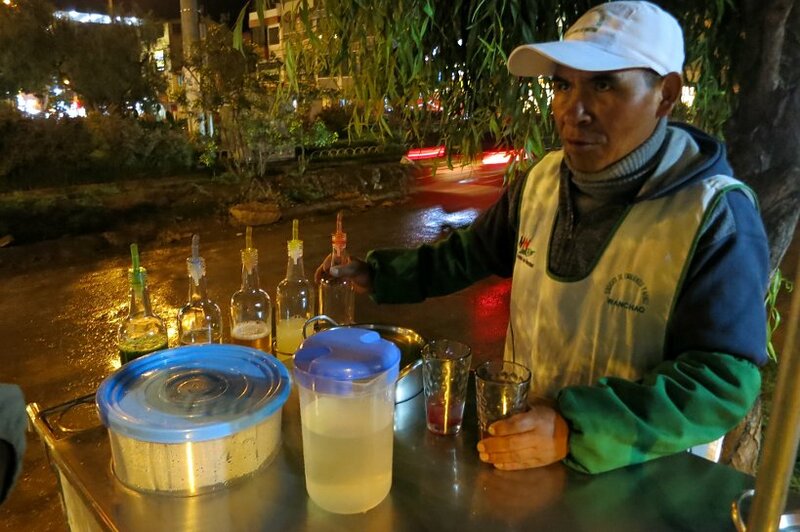 We spoke to the vendor who told us that the 5-6 bottles on the sides are liquids with healing properties made from natural plants from the Andes mountains. The main drink is called Emoliente which is on the flat surface of the cart. Based on how you are feeling or what your body need, the appropriate liquid from the side bottles are added in. The drink can be served either hot or cold. It was a wet and cold evening when we tried it, so we decided to go with the hot version. Our vendor put the main Emoliente in a glass and added in about 3 shots of natural liquids to help with stomach flu and indigestion. The first sip was a little bizarre. The drink was slimy, yet fruity. It tasted like there was a coating in the liquid. It was not disgusting or not drinkable, it was just unlike anything we have ever tasted before. Imagine drinking a hot, fruity, slimy and semi-sparkly beverage. The drink cost us S1 Peruvian soles or $0.30 USD. 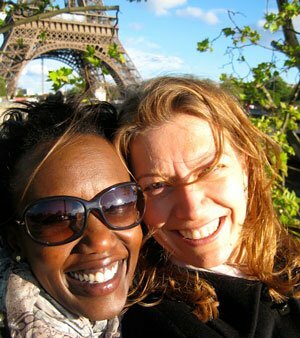 It felt quite good and we felt better taking something natural over drugs. After couple days of this diet, we felt much better and learned to enjoy this magical medicine on wheels. We took a few days off from tasting other Cusco food specialties, but are back on track and will be sharing more in our next posts. Cusco is a city that has a lot to offer; from its culture to its food specialties. 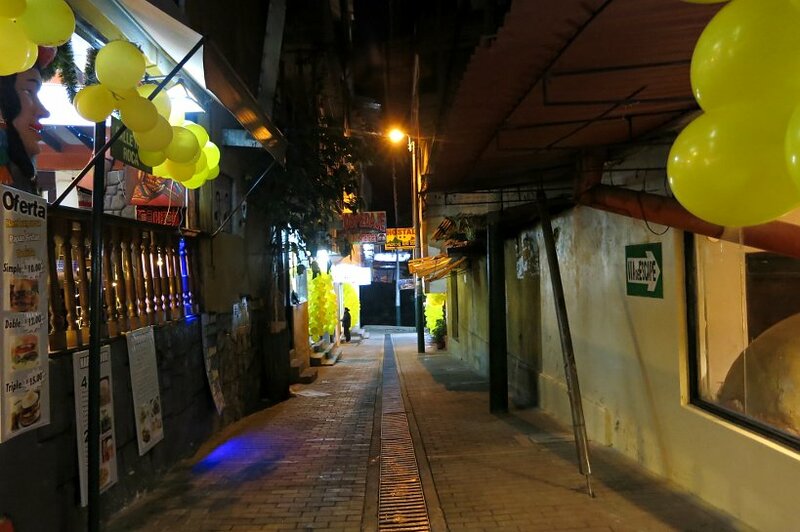 It is widely considered as the second gastronomy city in Peru outside of Lima. 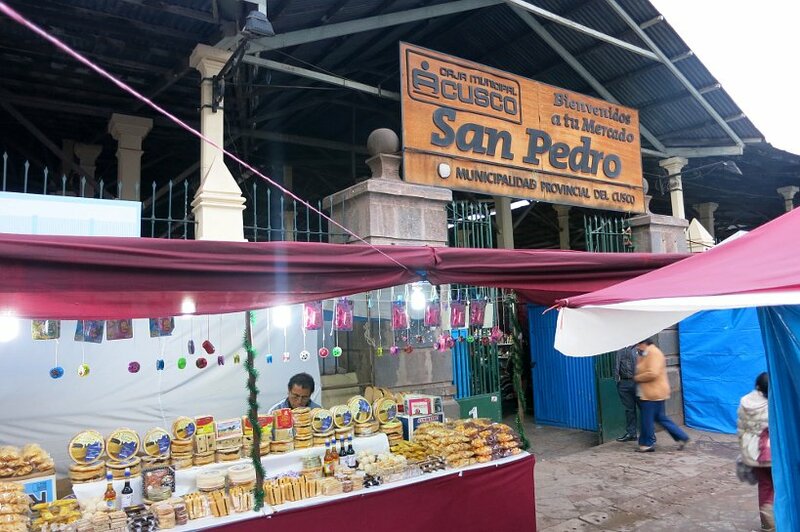 The best place to experience local and authentic food specialties is at Cusco market, Mercado San Pedro. 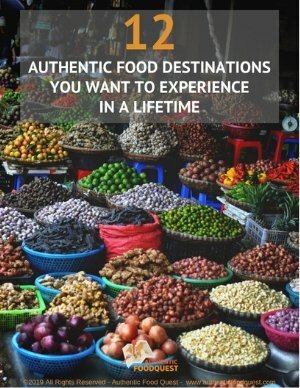 Here you will learn about the local specialties and get to enjoy a very unique and local experience. 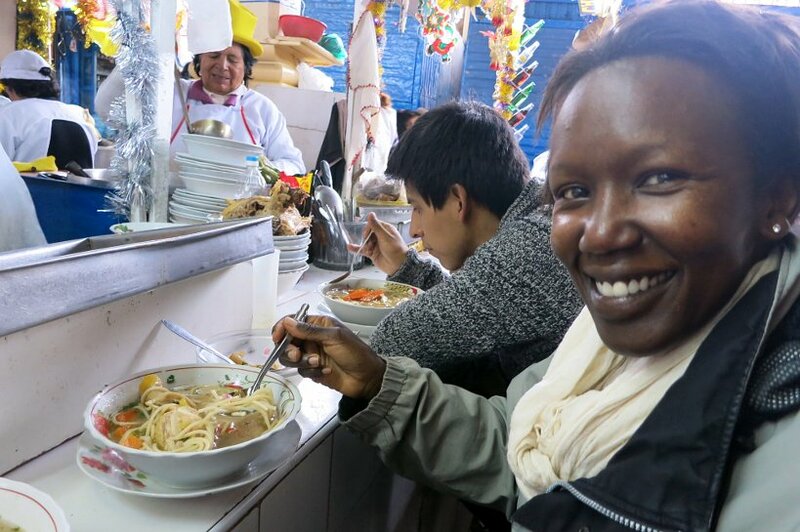 Don’t be afraid to eat at the Cusco markets. 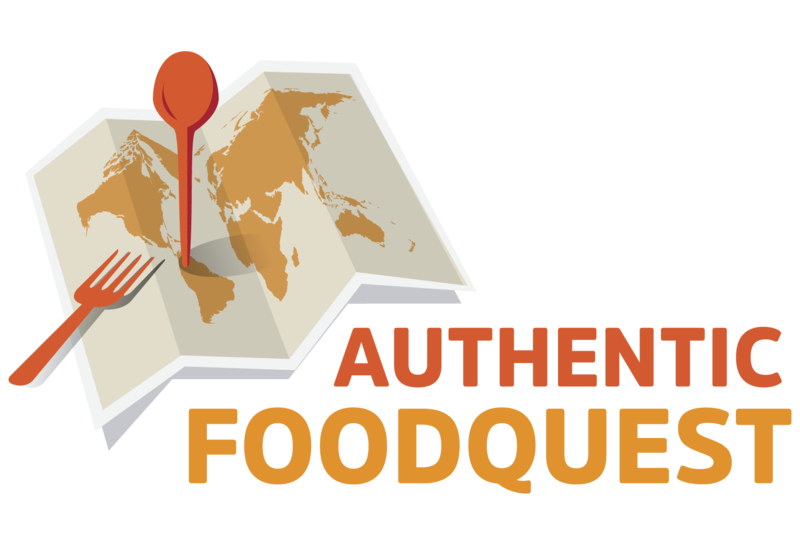 The market food experience and vendors operate at very different standards than what you would find in the U.S. or Europe. And that’s part of the charm. Eat safely and applying our basic food safety principles: go where people are, check the cleanliness of the stalls, avoid eating raw vegetables, and don’t eat anything that you don’t feel comfortable eating. 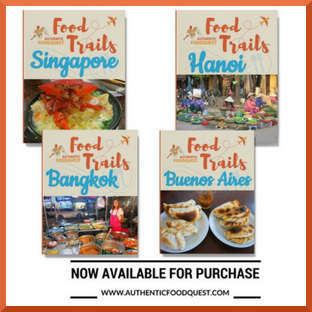 You can see more tips in our free ebook “The 5 Best Ways to Find Authentic Food While Traveling”. Take a chance and try the natural medicines. We’ve been amazed by how many natural herbs and plants there are for overall well-being. It’s a chance to choose natural over drugs with remedies dating back to the Inca Empire. Stay tuned for more intriguing local specialties from Cusco in upcoming posts including the Cuy (Guinea Pig). Thanks Krista for your comments. 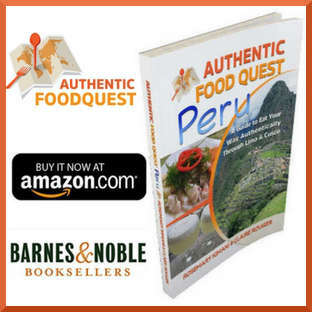 We have been really surprised by how much the Peruvians use natural remedies. This comes from their Inca heritage and you still see so much influence today. 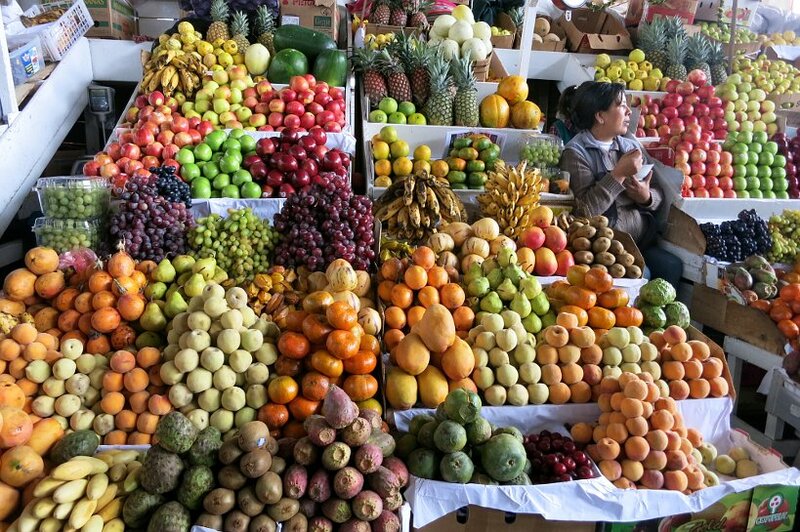 If you get a chance to visit the farmers market in Peru, you will see the strangest and most interesting fruits and vegetables, all with many health benefits. Cheers!! I so love exploring markets in a new country. It’s the best way to understand the food scene! 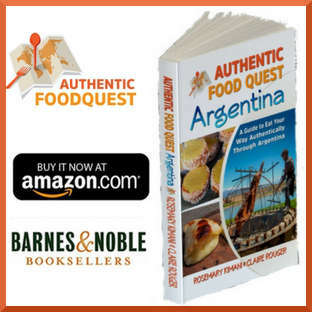 You are so right, Rosemarie…indeed exploring the markets is one of the best ways to understand the local and authentic foods in any city/region. Thanks for your comments! I did not know that about yellow. Fascinating. I would love to try the trout and fried stuffed peppers. Looking fwd to find out how you go with the diet. Make sure you write about it. Thank you Paula! Yes, we will dedicate a post on maca and the diet. Stay tuned for more soon! Thanks Lauren for your comments. We really enjoyed discovering the Cusco market and all the wonderful things available. In the markets you really get a sense of what is really local and authentic. Glad you like the pictures and dishes. A delicious experience! I adore markets, totally the best way to get a snap shot of the heart of a culture, totes getting on the yellow underwear bit if it will bring luck in my love life. Haha! 🙂 Awesome post, kinda jelly of all the awesome you are seeing. Thanks Anna for your comments. 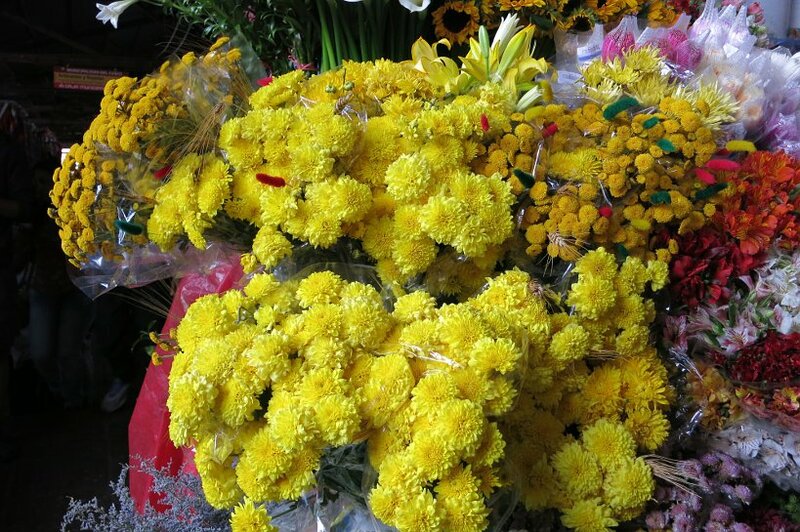 We were so blown away by all the yellow for good luck. What surprised us even more was when our airbnb hosts told us that they also wear yellow underwear as well. A really fun tradition to observe! Glad you liked the post! Wow. They really managed to find everything that was yellow or a shade of yellow. I really enjoyed Cuzco and would like to go back again soon. It’s such a traditional town with so many great markets and places to eat. I think I need yellow underwear, LOL. Seriously though, I was transfixed reading about the medicine cart and I am intrigued by the Maca drinks (they look like huge servings). 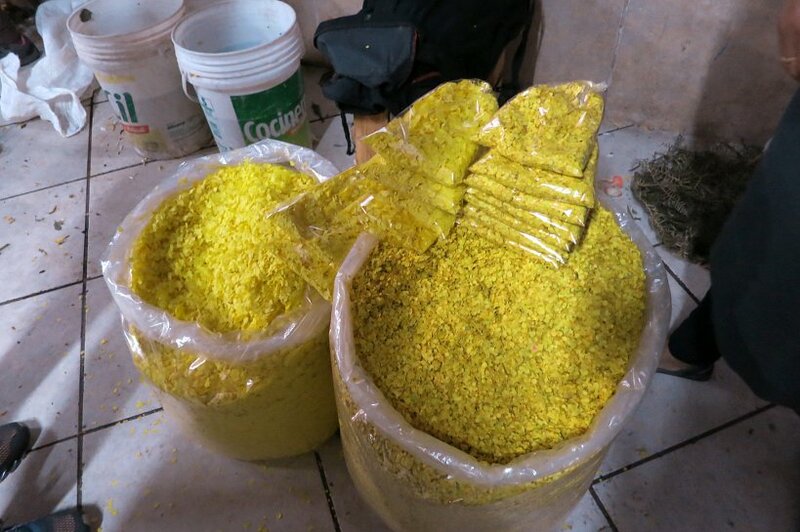 Indeed, yellow is the color for luck:) The natural medicines are amazing and interesting. Follow up post on maca coming soon. Stay tuned! !